Researchers from the University of the Witwatersrand in South Africa (Wits) and the University of Grenoble Alpes in France have mapped out regions where exoplanets can exist within triple star systems. The study, led by Franco Busetti, at the School of Computer Science and Applied Mathematics at Wits, shows that there are large stable areas where exoplanets can indeed exist in both binary and triple star systems. A binary star system is where two stars are in orbit around each other, while a triple system is when a third star orbits around both the stars in a binary system. "Because of the complex dynamics between these stars and planets, it was previously thought improbable that many planets would have stable orbits in these regions," says Busetti. As part of his Ph.D., Busetti worked with Hervé Beust of the Institute of Planetology and Astrophysics at the University of Grenoble Alpes in France, and Charis Harley at Wits. Together they ran over 45 000 high-performance computer simulations over a three-year period, examining all the possible combinations of orbits, dimensions, masses and other variables of a series of 24 different stellar combinations. They showed that it was indeed possible for exoplanets to exist within large regions of these systems. They also mapped out areas where it was most likely that these planets could be found. 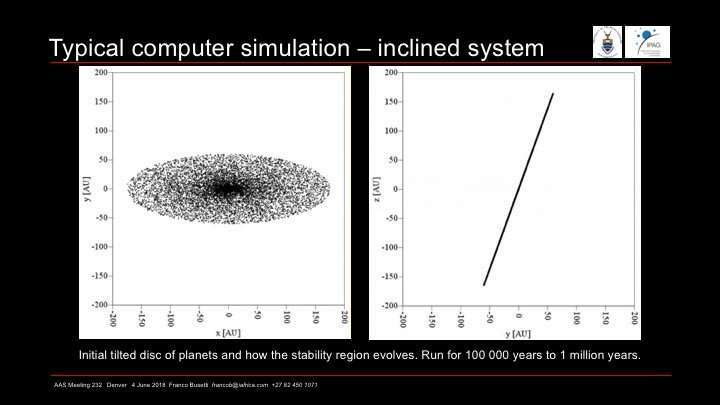 "We ran the simulations for periods ranging from 1 million to 10 million years, in order to see if the systems are stable over very long periods. If a planet is ejected from that system during this time, it is not stable." Exoplanets are planets that exist outside of our Solar System. Of the 3700 exoplanets that have been found to date, less than 40 are in triple star systems. Busetti says this is partially because very few triple systems have been searched. "The analysis shows that most configurations had large enough stable regions for planets to exist. Many of these areas are actually very habitable for planets." The research has been submitted for consideration to be published in the journal Astronomy & Astrophysics. Busetti has been invited to present this research at the 232nd Meeting of the American Astronomical Society in Denver, Colorado, in June 2018. The work could assist in guiding future observational campaigns to discover planets in triple star systems. "It could assist in selecting suitable candidates for a survey of such systems and guide the observational searches for them," says Busetti. "The geometry of the stable zone indicates not only where to look for planets but how to look." The results can also be used by other astronomers to quickly determine the feasibility of their initial observations of exoplanet orbits. I realize that this research is still in it's infancy and the development of sophisticated instruments needs to continue. But claiming 'stability' seems rather dubious. A few million or even few tens of millions of years of planetoid survival is rather ephemeral in the greater scheme of things. Questions that need to be answered are: How old are these stars? How stable are their binary orbits? How well developed are their proto-planetary disks? Would not the aggregate disks be disrupted before planetary formation is possible? After a few tens of millions of years, what happens next? In the article it was implied that these planets could eventually be ejected from these multiple star systems. Is this a predictable event? That we should be watching for?